Tom Bosley, whose long acting career was highlighted by his hugely popular role as the understanding father on television's nostalgic, top-rated 1970s comedy series "Happy Days," died Tuesday. He was 83. Bosley died of heart failure at a hospital near his Palm Springs home. Bosley's agent, Sheryl Abrams, said he was also battling lung cancer. TV Guide ranked Bosley's Happy Days character No. 9 on its list of the "50 Greatest TV Dads of All Time" in 2004. The show debuted in 1974 and ran for 11 seasons. After "Happy Days" ended, Bosley went on to a recurring role in "Murder, She Wrote" as Sheriff Amos Tucker. He also was the crime-solving priest in television's "The Father Dowling Mysteries," which ran from 1989 to 1991. When he was first offered the costarring role in "Happy Days," a series about teenage life in the 1950s, he turned it down. 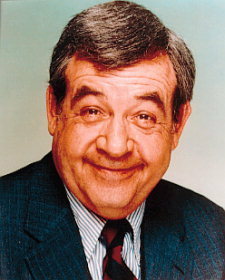 "After rereading the pilot script," he recalled in a 1986 interview, "I changed my mind because of a scene between Howard Cunningham and Richie. The father/son situation was written so movingly, I fell in love with the project." Propelled by the nation's nostalgia for the simple pleasures of the 1950s, "Happy Days," which debuted in 1974, slowly built to hit status, becoming television's top-rated series by its third season. It made a star of Henry Winkler, who played hip-talking, motorcycle-riding hoodlum Arthur "Fonzi" Fonzarelli. His image initially clashed with that of Richie and his "straight" friends. But over the show's 11-season run Fonzarelli would transform himself from high school dropout to successful businessman. After "Happy Days" ended, Bosley went on to a recurring role in "Murder, She Wrote" as Sheriff Amos Tucker, who was often outsmarted by Angela Lansbury's mystery writer, Jessica Fletcher. His own series, "The Father Dowling Mysteries," ran from 1989 to 1991. The avuncular Father Frank Dowling was assisted in his detective work by nun Sister Steve, played by Tracy Nelson. Although "Happy Days" brought him his widest fame, Bosley had made his mark on Broadway 15 years before when he turned in a Tony Award-winning performance in the title role in "Fiorello!" He also was the crime-solving priest in television's "The Father Dowling Mysteries."